Hello to those that have missed this post. Tragically the most important information in history is being delayed due to a lawsuit against a telecommunications provider under 17200 Business & Professions code for false and deceptive advertising. I am just so sick of corporate thieves that a break from using any seemed like a good idea, check your bills and sue them if they rip you off. Even though you'll probably lose just waste their time anyway, expose corruption. Let's get back to the blog. I was last writing how the Bibles written hide some true events which would coincide with all other Serpent related history present on every continent, even the Christian artwork contradicts some scripture. I am not the first to discuss this subject which goes back hundreds of years and it seems whom ever questioned this subject could be persecuted by the "Religious Police" but thankfully to many brave humans that would not accept the Church's view kept history for everyone later to figure out. The Serpent was in contact with Adam, Eve, Cain, Moses, Abraham and Jesus, etc.... If anyone is visited that practices any Abrahamic religion you are being visited by the Angels that taught your heroes the good things the religion tried to hand down and you are not under "Spiritual Attack". There are stories from Asia that arrogant priest and samurai were picked on due to their own problems and this may be happening to arrogant followers of Christianity or Catholicism, just look at some of their issues and whom they are blaming it on. I suppose you could become an "Adversary" of the GODs. Thank the Church for controlling your minds or history. 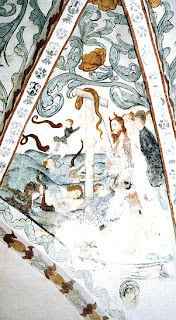 I am sure everyone has wondered why there are so many Moses depictions with horns or Serpent references in the religion. He was in contact with the horned Gods obviously like the others. Thousands of years later these same Gods are visiting there children today, yet still the oldest written history goes back 500,000 years to the Horned Gods and humans still haven't figured it out or accepted the historical fact. We have older history on earth but it's just another part of history not discussed or researched like it should. The Shepherd to Anu means The Shepherd to Heaven. It is my job to show everyone again whom the Gods are and how to get to Heaven since you go when you are alive like ancient history, our friends or family have been around way longer then us and your eternal life is what they have. I was told by your Gods or my family:) that Jesus and the other Patriarchs did quite a bit of writing which we do not have that would coincide with other world history, it's what was destroyed. Has anyone wondered why Satan's name appears 18 times in the Hebrew Bible, 37 in the Greek Bible, 39+ in the Latin version with a new name or interpretation in two scriptures that have no negative meaning (Lucifer) with Jesus but much slamming from elsewhere, 49 in the KJV and just keeps going, he also appears under other names. The things poor Satan is being blamed for are not truly Hebrew or Christian(Jesus) problems past or present? but Catholic, since too this day they are blaming him for the same things that were problems in past history coincidentally and the Romans did kill many Christian and Jewish folks not to forget all the other countries that faced conversion by brutality. I am speaking about the true original followers of Christ and not all the false apostles that exist today. The name Lucifer in today's cultural perception is the "Prince of Evil" but nowhere do we hear the "Light Bearer", Phosphorus or Helel is this so called bad guy when we dig deeper into rumors or history written. The Lucifer rumor is equal to that whole Sodom and Gomorrah thing having a direct "Homosexual Connection" when Sodom means "burnt" and Gomorrah means "buried" in Hebrew, see the lies of how some acts are broadly interpreted. The first image above is titled "The Evils of the World" by Fred T. Hall, 1883. Fred Hills image depicts all the GODs/etc.... as being one or the Serpent including GOD which gives us the first clue Fred is not religious being he titled the artwork "The Evils of the World". Why would Fred have GOD as one of the evils or the Serpent? It's obvious in 1883 most knew who they were speaking to in a good or bad way by experience or hand me down stories associated with the Serpent in the sky but for some reason we the current humans have forgotten. Fred understands these Gods are one and the same or on the same team but instead of seeing good he sees evil, why is that? Fred must be thinking that all the problems within religions historically have been chaotic to some extent from feuding and he knows what is flying in the air and sees the source as the Serpent or God/etc... for example the craziness of the witch trials of Europe and America that claimed some 9 million plus lives could have been one of many reasons why he would feel this way but was the problem the Serpent or humans misunderstanding since the people known as GODs in ancient history only teach good things just like now. I cannot blame the original followers of the Abrahamic religions that were forced to change their beliefs under violent oppression. Judaism is a polytheistic religion that turned monotheistic under the Romans. The Hebrew Bible has non Hebrew authors due to denigrating remarks towards Hebrews. The New Testament turns the "Son of GOD" Satan into the arch nemesis of his father or GOD and then makes Jesus the "Son of God" taking Satan's place which makes no logical sense. It even makes Saint Michael whom is the Serpent against himself in all the Church's paintings, no GOD but a human Angel in black most of the time attacking a dragon or himself. 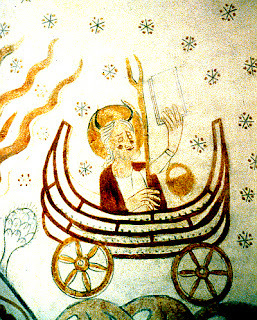 There are more images of Moses with horns and also with lights coming from his eyes like Freds image coincidentally. I hope this gets many to question some scripture or history since some scripture for example is very accurate that can be verified by me but other history does not match or fit the puzzle. 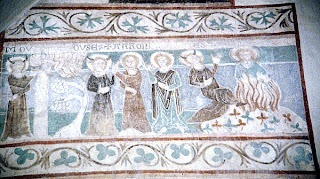 One big piece of the puzzle missing is a painting or woodcut of the modern day Christian God, for some reason we have images of many GODs in every culture except modern day Christianity. If we research Ezekiel which describes anthropomorphic angels with a person described as GOD that coincidentally matches the GOD's of other cultures and the two Deities or Angels being described in this blog which you can see are the same people or if you research the Qumran the Angels were named Ha rut and Ma rut. 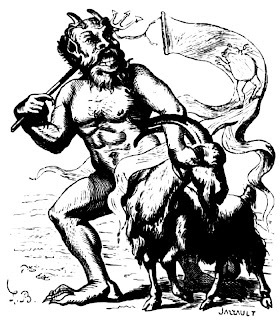 The third to last image is Azazel from a modern interpretation of Azazel, from Collin de Plancy's Dictionnaire Infernal (Paris,1825) coincidentally similar to the last Moses image(Collin was a Christian Theologian that converted to Catholicism after writing his book). There are a few more images that corresponds to the fact Moses was in contact with Yahweh or the Devil and they are the same entities. The second to last image is supposedly related to Stanislas de Guaita with a magician invoking spirits which happens to be the same GODs/etc.. on all the other continents. It appears the magician is having a bad experience given the situation and should serve as a reminder that bad intentions may have bad consequences. 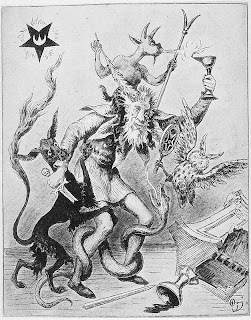 The goat with trident and feather, serpent, jackal/dog, bird/owl appear presenting the magician with an image of himself or his inner-self with another image in the upper left corner of a dark starred crescent object which represents or means the crescent shaped craft that comes at night which looks like a star that descends has these entities on board. the last image is a magician in his oratory. If you zoom in on the writing which is in a few languages including English and Hebrew spelling "Oratory", we can see the words "Tetragramate", Agla, Eloy, Saday, Adonai or Hebrew names of GOD and some reference to Hebrews origins. This is the part taken out which was the summoning of the GODs or "Raizing the Devil". Why do we have so many images of the Serpent or Devil but none of the Christian GOD??? (Christians step up to the plate). Why can't the "Fall from Grace" be documented as actually happening in chronological order of events that would coincide with other world or Biblical history? If Satan flies on a UFO and wears a space suit then the Christian GOD must fly on his own UFO and wear his own space suit or he doesn't exist because it doesn't coincide with facts, it's why this subject is not discussed by our Governments because the religious that fuel the "Thoughtless" can not logically explain history or their "Bible" to their followers. How do you get to Heaven being a murderer (10,000,000 witches??) or child molester? The best part of this story isn't having to tell the religious that they made a mistake but the fact that GOD or Saint Michael is not only the Devil but Santa Claus. I made a cryptic sarcastic comment on my previous entry about Santa Claus but is it coincidental again that an "Elf and Goat" reappear as a fat guy and reign deer on the same day we celebrate Jesus day and that they just happened to be in contact with Jesus also. We could amend the Bible to say Santa Claus is GOD and that is whom destroyed humanity previously, it would really screw up history by telling the truth. The first story in a complete civilization of Heaven, Creation, Gods, Angels, Deluge, Shepherd(Mul Apin), Cross(divinity) and Tree of life are recorded in ancient Mesopotamia between 4,000 to 6,000 years ago with other stories dating back 500,000 years. If we start to examine events around 2,000 years ago(give or take 500+ years) around Mesopotamia and surrounding regions to determine what were just a few important changes out of many that made today. We have the death of Jesus, death of the Arcadian and Greek Goat GOD Pan, the Roman wars against the Hebrews and early followers of Christ whom fought Catholics later, numerous conflicts in the Babylonian region where a pantheon of GODs ruled for about 3,500 years under numerous names (Anshar, Anu, Enlil, Enki/Ea) worshiped in different areas under other names at times documented to the 35th century B.C. but disappear around the 5th century B.C. or 500 after the death of Ashurbanipal 627 B.C. whom still recognized the original Sumerian GODs finally disappearing around 539 with Cyrus whom still recognized Marduk connected to the greater GODs but then Darius Hystaspis introduced Zoroastrianism into Babylon thus is when and where the "Good God-Bad God" story enters the region. The Persians took the region over around 500 B.C. to 300 when Alexander the Great and the Greeks takeover then the Romans in the region and this is when the entire Mesopotamia pantheon re-emerge under new pen names of Satan or the Christian Devil with a story of a "Fallen Angel" in the same exact region and city where the belief previously never existed since they were GODs which somewhere during the exiles of the Hebrews and the death of Jesus we have the time when these GODs changed to "Fallen Angels". The new religion takes the basic stories and symbols of Mesopotamia and rearranges events, characters and GODs while also conveniently degrades every cultural belief in existence as well of their normal evolutionary experiences of life while trashing what history the new religion could for the next 2,000+ years teaching every other God or religion is false, that killing or any inhumane act is O.K. 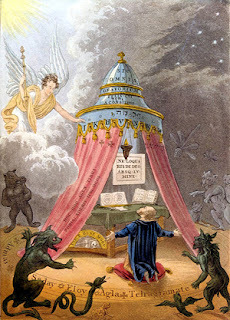 to commit if one is informed by this "New GOD" to do such act while teaching simultaneously you should not kill/etc.. and if you go to confession all your "sins" will be washed away simultaneously teaching all the acts were caused by the Devil thus alleviating any responsibility or accountability towards any horrible act which is the opposite of what the real religion or Christ their Savior taught whom warned of a false religion, not every has this exact view but is common. What Hebrew history is telling us is that "Angelology" came from the Babylonians but Angelology does not have much of a history in this region given it had GODs for quite some time. Most likely the Great Gods and Minor Gods were turned into GOD and his Angels given this is the closest you'll get in comparison then throw in the good and evil spiel add a little of this and that "voile'", matter of fact too close. If Angels were Minor Gods before then Monotheism isn't possible or is that Monotheistic Big Bang Theory. We have the OT GOD Jehovah, the NT GOD, Lord GOD Jesus Christ, Satan all as absolute, the Trinity or Father, Son, Holy Spirit, the Angels, Arcangels and/or 72 names of GOD within Judaic doctrines, so how is this Monotheistic. The Bible has 4 GODs (Jehovah, Satan and Jesus and some other person named GOD), 3 Sons of GOD (Satan, Jesus and Simon Magnus) and according to my Christian friends "GOD wrote the Bible" and not some illiterate fisherman or partially literate peasants. The never ending story of Christianity. Judaism and the past Mesopotamian religions both were Polytheistic with anthropomorphic beings. The claimed date of knowledge handed down within Cabala coincides with ancient knowledge handed down from antiquity from Mesopotamia. Judaism does not specifically say if it was from the Hebrew culture or from another culture that passed this information down but it was preserved to some extent in Judaism. The claimed other dates that are reiterated within Judaism in trying to keep in line with the languages date of origin do not coincide in the religious context of when the knowledge was exactly handed down. In other words the older date is good but was in fact passed down from another culture, due to persecution the religion had to coincide with a new empirical cultural belief. thus changing the religions future, the dates of 5,800 and 6,000 roughly do coincide in dates and context, not 2,300 to 2,900 which coincides with Hebrew and Paleo Hebrew give or take a few hundred years. The New Church or Romans/Catholics/Christians fought with the Jesus, the Hebrews or Synagogue over whom was going to control the Hebrew religion. The Bible contains degrading remarks towards Hebrews and Jesus even stooping to a low of accusing both of working with the "DEVIL" which reflects the "New Religious Non Hebrew and Christian Belief". Those that did not conform were brutally tortured to confess with "Cavorting with the Devil" that resulted in death and this same brutality was experienced by every culture on every continent. The New Religion took ancient knowledge "Plagiarizing" history to their liking to control peoples opinions because they had "BAD INTENTIONS" similar to some now. It's sad to see how many innocent people have been lied too, it would be nice to say "They just didn't understand stand" which is partially true but the "Elaborate Methodical Thought" behind the "New Religion" influenced by an oppressive empire is evident today 2,000+ years later, it's only been 156 years since the last known witch trial so who says this mentality doesn't still exist today. Has anyone theorized about "Christ the Redeemer" as in having to redeem the GODs in the eyes of their followers or maybe "Christ the Savior" has to do with saving humans due to "Dynamic human inept anti social behavior" or in Laymen's terms "They dug their own grave with stupidity as their light". The "New Religion" ingeniously pits GOD against himself by demoting him to an Angel that pits himself against Christ and GOD then turns "The Shepherd" into "The Anti-Christ" when the Shepherd in known and speaks, that's amazing, it is obvious some had knowledge of future events which is why magic/divination/astrology were removed from the practice of the religion. If we remove all negative Christian belief/imagery we discover all the Biblical characters are in contact with "Divinities". It defames all other cultures GODs as being "FALSE" then to slander the real relgions history is downright appalling and despicable given the number of humans that have suffered or been killed at the hands of "looney toon derelict delusional religious dunces". Imagine dying at the hands of claimed do-gooders not to forget it's the only religion declaring "Everyone else has false GODs" which has been historically documented on every continent during "Conversions of Faith". The new religion covers up humans true history and the death of Jesus Christ, it does not mean some good information has not been passed down it just has been tinkered with to coincide with the new religious belief while keeping some ancient Roman traditions such as taxes, sexually perverse society, oppression thru suppression, murder, religion, etc... "What you know or don't know may or may not hurt you". The new religion has very little to do with Jesus or any Hebrew religion or any other perception of GOD/s etc,,, making Christianity the false religion Christ warned about rising up to defraud all the followers of speaking with those people known as "The GODs". Another example that history has been stolen by the people responsible for killing Hebrews, Jesus with his followers and many other innocent humans is the fact the new religion secretly has everyone worshiping the person the religion calls the "Devil". If you celebrate Christmas you are "Cavorting with the Devil", if you go to a Hospital you are cavorting with the "Christian Devil" and one of his "minions" whom wears the "Cadeuses" and especially if the Hospital has the words Catholic, Christian, Methodist, Presbyterian, etc.. integrated into the name thus one would be visiting a "Temple of the Devil" which once again contradicts the actions or motives of these people. An "Apocalyptic scenario" has always been a central theme around the past and present neo-religiopolitical landscape or "Poison Bush/Oak" that has grown into place infecting all whom touch the "OILY BUSH" which inflames the outer layer of our planets skin coarsing it's way through the "Arterial Universe" causing much irritation everywhere the oil has spread :) and it would be a shame if these same people were trying to invoke that "Apocalyptic scenario" by playing in "The Christians Devil's Playground" to attack humanity by destroying his work or our history since this perception is rampent among Christians that are waiting for GOD to battle it out with his "Fallen Son" and then mainly Christians(cultural perception) will be transported to some "Heavenly Abode" while the rest will suffer some eternal punishment in Hell which according to 18/19th century Christian/Catholic it is a place where you get "EDUCATED" but for some reason Hell varies with some religious able to describe it as an icy or fiery place that tortures your soul. Which is it Church the religion is serving "poo poo cake" with delicious filling inside at times which contradicts the traditional delicious cake with "poo poo filling" that is served weekly and remember religious folks "Your paying for it". "Humans are like tires: If you go to fast you'll wear out early, go too slow you'll not see as much, go off road you might get a flat which will take time to fix but may be adventurous, have a slow leak or put the wrong pressure in and you'll pull to the "Left or Right" leading to a rough ride but travel in the right direction with the correct pressure(attitude) and you'll see more then going in the wrong direction, do it before your brittly old and just pray your "Re-treaded" in that big tire factory in the sky." Religion can be like eating at a fast food restaurant: You order a number 1 because the image of the meal looks good but you don't get exactly what they show or they serve you a number 3 saying it's a number 1, sometimes overcharging for services, then you have to worry if the meal is healthy/safe to eat or will it give you food poisoning forcing you to pray to "The Porcelain GOD"." "Our history is suppressed of our ancient past knowledge being if you lack "WISDOM" you are in essence "Gullible" and "Ignorant" easily malleable conforming to the slightest thoughts or opinions for good or bad." Please question religion and get the word out about this subject. Is it 6007 or 5,807 or something or is it really 2007, is Enlil and Enki/Ea still Sky Gods or is it the Madonna and the baby Jesus that are Sky Gods or was that Isis and Horas? (Thanks Church). Question history because if we don't cherish it the GODs will destroy the "LIE" humans will start over again and many will be sacrificed. All those doom stories from other contactees are very real but these events could be averted by respecting the people called "GODS" in ancient history. The Government idiots, private elite and Vatican(unload that vault) need to just go enjoy all their money and let all those other hard working people fix everything, get out of the way and let history be told, accept your humiliation. The Mul Apin is running out of time and humans need to show their true colors for when the GODs return to the surface of our planet to speak with humanity otherwise you will all get to meet me and your GODs in the end to sort out the crap you all bad people helped to create, it's sorta like destiny or something with the "DIVINE":). I want to discuss or get back to what may happen if you go outside and start talking to the sky, most likely nothing unless they are treating you to a show. If they treat you to a show you may see a red, yellow or white craft decsend rapidly making what appears to be either a pillar of fire from the red craft or lightning if it's the white or yellow craft. When you see it you'll know this blog is real so just enjoy whatever you see. My friend that has maybe seen these craft a hundred or more times both high, low, slow and fast has no memory of any visit "YET", so enjoy any aerial demonstrations if they come. Be consistent with just talking to them on a regular schedule and when they are around they'll say hello, their way. You may get to see something no one else will see or just a simple fly-by. I briefly discussed in my first blog what triggered this event to occur which was stress related. I prayed for "Divine Guidance" for three nights under the stars and the same UFO that was previously seen came back, why pray???????? under the stars??????. The stress that made this event possible was a job injury as a carpenter in 2000 after a 7 year battle with Workman's Compensation whom committed numerous "Felonies" by altering medical documents that hid or down graded my spinal injury and a second disability caused by injectible medications. To make matters worse WCAB Judges, the Sate Attorneys Office and Governor are blocking all workmen compensation investigations and trials due to more then 1 billion dollars stolen from California citizens by the defrauding of benefits. I lost my little home on my hill in the "Great Real Estate Scandal" which truly is absurd to discover what really goes on in that business. living was economical until the greedy bloomed, bad timing for everything but found GOD or my family. When they picked me up they transported me onto a domed table that floated around from another area. I mentioned before that the craft was illuminated from the glowing of the outer shell. All the metal was dark grey, there were no flashing lights inside and the craft was the cleanest smelling place that a human could experience. I had mentioned before two questions were asked by me the first being whom are the little guys which Enlil responded by lowering his right hand to his side to show the small "Grey" deity everyone sees. I then asked if we were on the red UFO which Enlil gestured with his left hand higher up to a window. When Enlil made these gestures he was making the sign of wisdom the Goddess Sophia is seen in her depictions. This detail was not mentioned previously beyond that there was no pact with the Devil as a jealous religious zealot would let one believe. There are humans from previous life cycles from Earth on those craft that figured it out and that our world is not quite what it seems so put your smily face on:). I will add to this blog from time to time. You can respond in any manner hopefully it will be intelligent and make sense. If you would like to challenge my belief because you do not agree feel free to use what history you wish, just don't push a view that has no logical or real answer. Cool blog, good topic! I have studied this symbolism informally for quite some time now as well. I have infact designed my own personal signet which incorporates the symbol of the Seraphim. 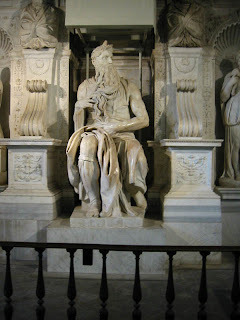 I do know however that the reason Moses was depicted in in some instances with horns on his head was because of a mistranslation or misunderstanding that stemmed from the original Hebrew texts. This is derived from a misinterpretation of the Hebrew phrase qarnu `owr panayv (קָרַן עֹור פָּנָיו). The root קרן Q-R-N, may be read as either "horn" or "beam (of light)." `Owr panayv (עֹור פָּנָיו) translates to "the skin of his face". Interpreted correctly, these two words form an expression meaning that Moses was enlightened, that "the skin of his face shone," as affirmed by the KJV in Exodus 35:29-35. The Septuagint properly translates the Hebrew phrase as "his face was glorified"; but Jerome translated the phrase into Latin as cornuta esset facies sua "his face was horned". Another example of this mistranslation that occurs within the KJV itself is in Habakkuk 3:3-5, "God came from Teman, and the Holy One from mount Paran. Selah. His glory covered the heavens, and the earth was full of his praise. Before him went the pestilence, and burning coals went forth at his feet." "Satan is God of the World" which is where my next most startling revelations of the past 4,ooo years(about?) will be discussed. It's sad that Christianity has ruined Judaism by replacing their Son of God with Jesus, much bickering, then creating a borrowed story from the Hindus, Egyptians, Syrians, Greeks, Budhist, Essenes, Mesopotamians, etc.... is absurd when used word for word, what is original in the NT is minuscule. All the animal symbolism of the four evangelist are the same GODs being discussed. They were all in contact with the same GODs, crap the Romans had it correct like the Hebrews/Israelites/Jews but that greed bug got the best of them, steal their information and kill them off if they don't bow down. Christians are under spiritual attack by the Jewish Son of God??????????????OK:):). Make a bad story about those GODs from ancient history and they may pick on the wicked:). My advice practice Judaism the Levites loved the Serpent GOD or GOD. Great more history to come folks, they've known all the way up to 1875 about "The Great Twin Gods" and what they looked like.